The hot exhibition ticket in London is the British Museum’s Pompeii show. For the rest of the summer, many dates have only late-evening tickets available. So the expanding reach of cinema experience of live events (previously confined to opera, dance and theatre) is very welcome. We open to hustle-bustle music, to get us in the mood for our guided exhibition tour, and a crane-shot zooms down on Peter Snow at the front entrance, telling us how exciting this all is. Then another introduction breathlessly itemises the number of people involved in putting the show together. And Neil MacGregor, the Museum director, appears for a third introduction, again stressing numbers. It’s as though they don’t trust their material. Which is odd, because the material is fabulous. Telly dons abound – Mary Beard, Bettany Hughes – as well as the chef Giorgio Locatelli, who gives a recipe for stuffed dormouse. “Just like rabbit!” he cries. “Use pine-nuts”, he encourages the appalled Peter Snow. The brilliant Andrew Wallace-Hadrill, director of the Herculaneum Conservation Project, enthuses about sewer archaeology to the still-appalled Snow: “The Herculaneum sewers are an absolute joy,” he cries. And it is a joy that he can make us understand why, as he shows the jewels, ceramics, even statues that slipped down the drains. Bettany Hughes takes over the appalled slot, as Mary Beard looks at a winged phallus windchime. We don’t know what the phallus represented, she makes clear; she lists possibilities, but is good on the great uncertainty that is the past. After a reconstruction of the eruption and the pyroclastic surge that engulfed the two towns in volcanic ash, the final display, a collection of possessions found on the beach at Herculaneum, is heart-breaking: a lantern used as the fleeing crowds stumbled around in the night that descended at midday, a key to a house to which its owners will never return. Peter Snow, no longer appalled, is now thrilled. “Isn’t it terrible?! What exciting things!” he crows. “An intense human tragedy,” he adds, chuckling over the plaster cast of a couple and their two children in their death-throes. With gracious restraint, the exhibition’s curator Paul Roberts provides a measured and touching response to this curious empathy-bypass: the tragedy, he explains to Snow and us, enabled those who died so suddenly to live on, to share their lives with us 2,000 years later. The camera could linger longer on the exhibits, and it would be nice if, every now and again, the talking heads just stopped talking and let us look. But the British Museum’s Pompeii is an extraordinary achievement, a fine combination of scholarship and showmanship. That it can, via Pompeii Live, reach a wider audience can only be a good thing. Olafur Eliasson’s The Weather Project (2003) was one of the most successful of the Tate’s Turbine Hall grands projets. Two million people came to stare at Eliasson’s big sun, many sprawling beneath the installation as though it really were a sun and the Tate had suddenly transformed itself into a public park. This is Eliasson’s gift: his art is incomplete until it elicits a physical response from viewers. With Little Sun, viewers carry individual “little suns” – 11cm daffodil-yellow flowershaped plastic lamps strung from lanyards – and walk around a specially opened gallery after dark, their “sun” picking out each artwork. The lamps become our eyes. No longer passive, we are forced physically to engage with the works in front of us. No longer can we automatically find the best viewing spot in front of a work. We must make conscious decisions – caption or painting? – about things we rarely think about in daylight. The space the Tate has chosen is its Surrealism galleries, where pieces like Joseph Beuys’s Campaign Bed, or Jannis Kounellis’s Untitled (1979) – all 5 metres of charcoal drawings and stuffed birds – can no longer be encompassed in one glance: viewers must establish, section by section, the artists’ intentions. (And if the artists intended that their work be encompassed in one glance, well, that too must be pieced together.) That is Eliasson’s intention, at any rate. The Tate has, however, underestimated how much light the lamps cast, and overestimated how many people each room can hold and still remain dark. When I entered on the first blackout night, although the warder told me to turn on my lamp, there was no need: the number of lamps already lit meant that I could not only see the art, but even read the captions, with ease. Thus can artistic aims be subverted by practicalities. Mundane necessities such as ticket sales or health and safety often win over art in contemporary galleries. The Weather Project was a simple concept, perfectly realized. By contrast, the execution of Little Sun is closer to Ai Weiwei’s notorious Sunflower Seeds (2010), where millions of porcelain seeds were spread across the Turbine Hall. There, too, visitors were supposed to interact with the piece as they walked across the crunching seeds. Then, when it was discovered that this was releasing toxic dust, the seeds were corralled behind barriers, like those public parks with “Do not walk on the grass” signs. Eliasson’s has a second intention, and a more important one. The 1.6 billion people worldwide who live without access to electricity pay on average 300 times more for their light than we do. These solar-powered lamps provide ten times more light than the kerosene lamps most people are forced to rely on, at one-tenth of the cost. Kerosene, as well as being a fire hazard, produces emissions which are the equivalent to smoking two packs of cigarettes a day. 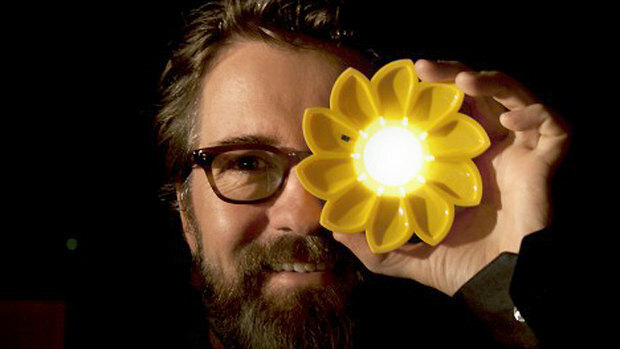 And so Eliasson established a business, the Little Sun company with the engineer Frederick Ottesen to create safer, less costly renewable artificial lighting. Few are more fervent than I in the belief that art fills an essential need. Yet however fervent that belief, some things are more important than going to a gallery on a Saturday night. If Olafur Eliasson can enlighten those of us who have time and resources to devote to art, well and good; but if he can literally enlighten places of darkness, that must be more valuable. The artist Howard Hodgkin has been collecting Indian art since he was at Eton. For some years now his collection has been on loan to the Ashmolean, and a rotating selection of pictures from it are frequently on display. Yet to see all 100-plus works together is a revelation, as viewers get a sense not only of the collection, but also an insight into the collector’s personality: what speaks to him. Miniatures from the Mughal empire often depict tiny, enclosed spaces, with figures delicately placed among painstakingly reproduced textiles and carefully detailed flora and fauna, the layers of pattern deftly weaving themselves into magically perfect worlds. Hodgkin is drawn to these depictions of what he calls “a whole world”, one that’s both “completely convincing” and “completely separate” from Western tradition. But Hodgkin also appears attracted to more open compositions, to works that integrate the white paper as an element in the image. He obviously also has a passion for elephants, perhaps because they too are most often displayed against flat coloured backgrounds – though the animals’ combination of majesty and charm as painted by these Indian masters would beguile anyone. However minimal the composition, the personalities of these royal beasts shine through. One even appears to have his eye slyly on the viewer, almost smiling with shy pride at the splendour of his flowered saddle-cloth. 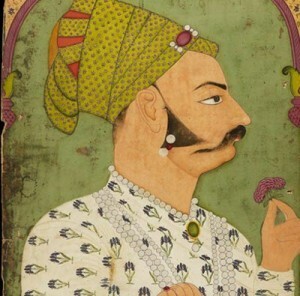 Other works head towards abstraction: Sultan Ali Adil Shah II hunting a tiger (1660) shows a gloriously gold-gowned bowman taking aim, but the eye focuses more on the elaborate textile folds and greyed-out background than on the action, the tiger merely snarling quietly at the edge of the page. Some are quirky curiosities, such as Maharaja Balwant Singh and a goose, a drawing of a courtyard flattened out schematically, like a blueprint, while in the centre, staring solemnly at each other, are a goose and a man, the latter a stark black-pencilled silhouette adorned with a pair of pink shoes. What is this a picture of? An omen, a dream, a legend? Or just the ultimate odd couple? As well as these works from the major artistic centres of Mughal art, there are also a number of pictures from smaller Rajput courts. Particularly beautiful are the tiny works created to illustrate the subjects of musical modes, or ragas (currently the subject of a smaller, less refined show at Dulwich Picture Gallery) . While it’s easy to find analogies with Western art, the uniqueness of these works always fights back. The colour-world, for one, is inconceivable in the West before the 20th century, filled as it is with hot pinks, dazzling oranges and acid blues that make even the Fauves look tame. Bright colours do not necessarily signify a cheerful world, though. Bhadrakali, the Destroyer of the Universe, is a blue-skinned four-armed goddess who literally consumes the dead, and here the intense colours highlight Kali’s power as she defies both time and death. And that, of course, is what great art does: it defies time and death. In the end, the labels “Western” and “Eastern” do not matter. As these two shows allow us to discover, a “shot to the heart” is there for anyone who has the will to look, and the desire to learn. The world of Mughal enclosures, diamond-bright and bejewelled, could not be further away from our own; and yet, like the goddess Kali, the art it produced devours time and space, defying the centuries to continue to move move us today. There are three David Hockneys, I think, and only one of them matters. The first one, and the least important, although the most intrusive, is the public David Hockney, the 1960s owl-bespectacled mop-top turned 21st-century curmudgeon, the one who writes letters to the newspapers and fusses about what the modern world is coming to. He is amusing or irritating, depending on one’s own personality, but he is also easily pushed aside. The second David Hockney is more difficult to overlook. This is the David Hockney of reproductions, the Hockney of A Bigger Splash and Mr and Mrs Clark and Percy – not the paintings themselves, but of postcard and poster reproductions. This David Hockney is troublesome, because he stands in the way of the real David Hockney – and more worryingly, he stands in the way of a clear view of the real David Hockney’s work. For the surprising fact is, David Hockney’s work does not reproduce well, does not give a good idea of the real thing. This is the case with many artists – Francis Bacon springs most readily to mind. But reproductions of Bacon’s work look just plain bad: unclear, muddy and fussy. Unless one is of the ‘all modern art is a scam’ school, the paintings look so bad in reproduction that it is always immediately clear that they must be poor facsimiles. Reproductions of Hockney’s works, however, look sensational. They are vibrant, clear, and full of Pop-y joie de vivre. 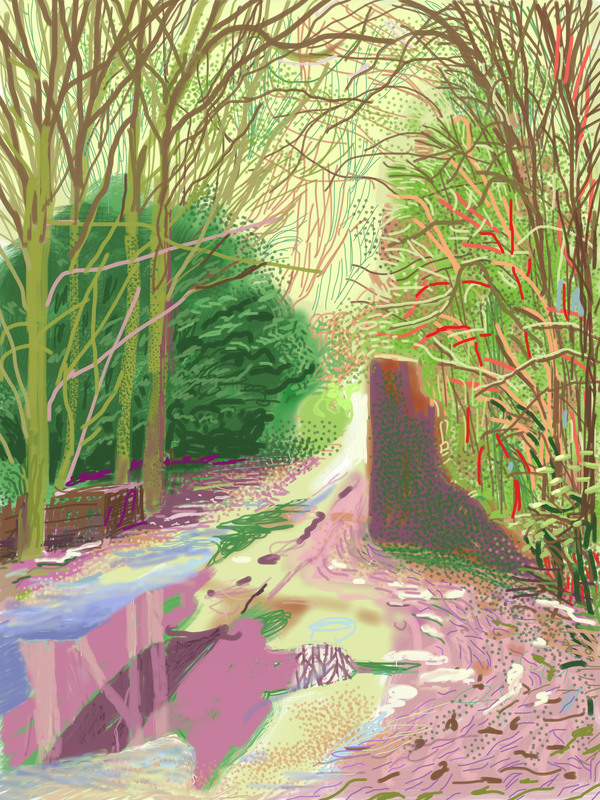 They are slick and cheery, picking up and even intensifying Hockney’s great graphic strengths. Mr and Mrs Clark and Percy (1970-71) is not just an iconic image of the 60s and 70s. It is also one of the Tate’s best-selling postcards, and it was number 5 in the BBC’s poll of ‘The Greatest Painting in Britain’ (as well as being the only 20th-century image to make the list). The image, almost certainly, is far more often seen in reproduction than it is in reality. The Ambassador Theatre Group has just announced a wonderful new innovation. Before a play begins in one of their theatres, Gordon’s gin ads will be projected onto the safety-curtains. Maybe I’m old and sad. I’m certainly grumpy. But really, does everything have to be an opportunity for advertising: do we really have to ‘monetize’ life? Isn’t there some way of living without people shrieking ‘Buy buy buy’ into our ears every moment of the day and night? And now, when we go to see Hamlet, we’re going to be bombarded with messages to drink gin. God knows, it’s enough to drive one to drink.